AMHERST, Mass. – University of Massachusetts Amherst food scientists have mapped and characterized microbial populations in a vegetable fermentation facility and report that its microbiome was distinct between production and fermentation areas and that the raw vegetables themselves – cabbages destined for sauerkraut – were the main source of fermentation-related microbes in production areas rather than handling or other environmental sources. Writing in Applied and Environmental Microbiology, UMass Amherst Commonwealth Honors College student and co-first-author Jonah Einson, with research fellow Asha Rani and senior investigator professor David Sela, say this study helps to resolve the question of how microbes are transferred within a food fermentation production facility. The UMass Amherst team collaborated with scientists from two units of the U.S. Food and Drug Administration's Center for Food Safety and Applied Nutrition and another in Winchester, Mass. Real Pickles is a worker-owned cooperative in Greenfield, Mass. and makes pickles, sauerkraut, and other fermented vegetables the old-fashioned way, by natural fermentation and without starter microbial cultures or other media. Nutritional microbiologist Sela notes that very little is known about the microbiomes of these facilities. Fermented foods are increasingly popular internationally, he adds, because of their enhanced nutritional properties, cultural history and tastiness, so the new information from this study should be of interest to food scientists, microbiologists and manufacturers around the world. 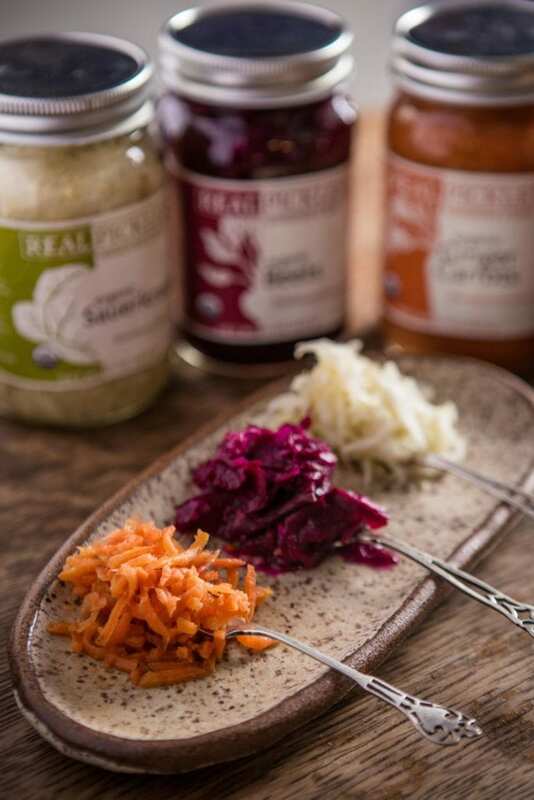 Sela says, "We're grateful for the cooperation and collaboration we received from the management and employees at Real Pickles for the opportunity to carry out this interesting research. We're thrilled that they were so open to working with the FDA. Not all companies would be comfortable having government regulators come in to assist with scientific research. This was a great academic-government-industry partnership. Also it reflects the exciting explosion of interest in fermented foods and beverages we are experiencing locally in western Massachusetts and beyond." Company founder Dan Rosenberg says, "It's fascinating to learn about the influence of fresh vegetables in establishing our facility's microbiome and suggests that our use of organic vegetables is important to contributing a diverse microbial community to support fermentation. It raises interesting questions about how we can further improve our production practices to be producing fermented and probiotic foods of the highest quality. We're excited to participate in research that improves understanding of fermented food production and nutrition." Sela notes that he, Einson and Rani used a state-of-the-art approach to this survey, using high-throughput sequencing and genomics to identify microbial species present instead of culturing the microbes. This allowed the team to quickly identify more microbes than conventional methods, to estimate their relative numbers, predict their likely function and determine the flow of microbes into and within the facility. He adds, "For the first time, we built a map of the facility and how it was transformed over time during fermentation, which has given us a more complete picture of the population in a real vegetable fermentation facility. Both cheese and beer have been done to a certain extent, but we feel that fermented vegetable facilities could be better characterized. And because we are using these new genomic tools, we have a better understanding of what is there and how they got there. Using the traditional approach, we couldn't possibly culture everything, so we'd have a far more limited picture." The researchers report that Leuconostoc and Lactobacillaceae dominated all surfaces where spontaneous fermentation occurs. Also, they found that "wall, floor, ceiling and barrel surfaces host unique microbial signatures." Sela says Einson, now a graduate student at Columbia University, took the early lead in this study as an undergraduate. He swabbed surfaces in the plant's fermentation room, processing area and dry storage surfaces to collect microbial samples, identify microbes present before and after cleaning, and in linking specific microbes to certain food processing stages. After he graduated, Rani took over and completed the project. Sela says next steps might be to see if similar findings may emerge in other vegetable processing plants around the world, whether seasonal changes might be observed and whether microbial populations change with different cleaning protocols. "It's not as important when making traditional sauerkraut," he notes, "but some other food processing facilities might face more risk of spoilage and it would be interesting to see what microbes are present at various stages. Batches of food do get spoiled and we never see that as consumers, but it costs a lot when a whole batch is lost. We might be able to find a way to predict when that might happen by understanding the microbiological communities that surround the processes." This work was funded in part by the Center for Produce Safety, and Einson was supported by an American Society for Microbiology summer undergraduate research fellowship, a research assistant fellowship from the UMass Amherst Commonwealth Honors College and a UMass Amherst Center for Agriculture, Food, and the Environment summer scholars fellowship.